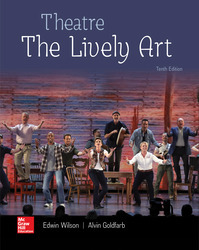 New to this edition are “evaluating” questions at the end of each chapter that discusses a theatre element. These questions are meant to help students write papers about productions they are often required to attend. In addition, at the end of the first history chapter there are questions to help students evaluate a production of a historic play and, at the end of the final chapter there are questions one valuating a production of a contemporary or new play. Connect:A highly reliable, easy-to-use homework and learning management solution that embeds learning science and award-winning adaptive tools to improve student results.